A friend, Dana Chisnell, is starting a kickstarter campaign, "Field Guides for Ensuring Voter Intent", to develop and produce a series of design and usability field guides for election officials. Dana, among many other things, is the co-author of the Handbook of Usability Testing we used at Berkeley when I was in IS214 (Needs and Usability Assessment). The basic idea is that there are a lot of problems in human interaction with voting systems that can be easily avoided by a few smart design choices, low-overhead user testing of ballots, and other kinds of techniques and insights. Dana will spearhead the creation of a number of guides designed for election officials in mind that address common usability problems and techniques for avoiding them. It looks like a neat project, and I encourage you to back it, if you deem it worthy. For funding levels higher than $30, you get a copy (signed) of each guide they produce... higher levels include hand-made art of a mascot for the project, "Chad Butterfly"... the uppermost levels of funding allow backers to pick an election official of their choosing to receive a consultation with Dana about usability aspects of their election process. This is a neat example of both civic design and indie usability funding! Bravo! I hope Dana meets and exceeds her funding level! Make no mistake about it, Louis C.K. is one of the funniest humans alive. 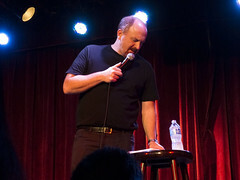 The web has been abuzz this last week about an experiment Louis C.K. performed where he released his latest comedy special at a low price and without DRM. Tuesday, he released a statement where he described the results of the experiment: in short, he broken even after only twelve hours. His statement contains a lot of compelling rhetoric about cutting out the middle-man and delivering a more fair and flexible experience to his fans. However, when I went to go buy the video, I was surprised to find the terms and conditions are very different from the rhetoric of his statement. Louis says a lot of things in his statement, but a few things stood out to me. He sought to (1) lower prices, (2) make purchase and viewing easy, (3) eliminate restrictions on viewing, (4) reduce incentives to "steal" content, (5) not use purchasers' personal information as an asset, (6) promote collective ownership of the product, and (7) eliminate contacts and marketing from the producer. NYC's ABC7 did an awesome spot on Scott's Pizza Tours, my favorite local activity. It's a great piece that describes well what you learn and experience on one of Scott's tours. I'm briefly in it and say a silly quote, trying to emphasize the sheer variety of different kinds of pizza that drives us pizza enthusiasts. "MINNEAPOLIS (WCCO) -- Detailed medical information discovered on the back of a first-grader?s school drawing sent Minneapolis school officials scrambling. Long story, short: Ms. White's records that she voluntarily gave to a law firm representing her after a car accident were donated by a paralegal to Ms. Kane's daughter's elementary school. These records, and those of presumably many others, were found by school officials after being used as scrap paper and have since been secured, probably waiting disposal (or, cynically, placed in escrow until the new team of lawyers Ms. White might hire to sue her old lawyers get a chance to look at them!). Ms. White expresses concerns that we see often in cases of privacy breaches, especially medical breaches: "It?s got my account number, my birth date, my job ... I?m outraged. I am embarrassed. I don?t want anyone to know my personal information.? What recourse does she have? Well, because the law firm is not a "covered entity" under the federal law and accompanying regulations known as the Health Insurance Portability and Accountability Act (HIPAA), the responsible enforcement agency, the department of Health and Human Services, can't seek corrective action. In fact, you may be surprised how little HIPAA and HHS can do in situations like these. Our friends at the World Privacy Forum keep a very useful FAQ about HIPAA and also point out how medical identity theft, where people use medical information about others to obtain services or make fraudulent claims, is on the rise and an increasing concern for patients. What can you do? Be vigilant, as always. Make sure you monitor and understand your health insurance claims information and that you let your health care providers know if you suspect funny business.